Colombia:	Eyewitness to Revolution | Fight Back! 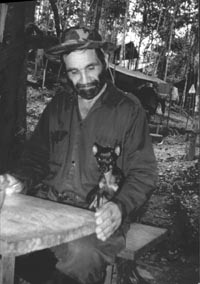 FARC combatant, Tio, with his pet dog at the mess hall. Jessica Sundin, of the Colombia Action Network, led a small delegation of three North American activists to Bogatá in July 2000, to attend a conference responding to U.S. military aid. The delegation also traveled to the area in Southern Colombia controlled by the guerrillas of the Revolutionary Armed Forces of Colombia - People's Army (FARC-EP). Fight Back! interviewed Jessica about what she saw there. Fight Back! : You recently had the opportunity to travel to Colombia to attend a conference on U.S. intervention and the so-called "Plan Colombia." Could you begin by explaining what Plan Colombia is? Jessica Sundin: This year, President Clinton, along with the president of Colombia, launched Plan Colombia. The Plan gives Colombia $1.5 billion to buy attack helicopters, spy planes, high-tech surveillance equipment, and weaponry. This military aid goes to the Colombian Army, to fight the war against left-wing guerrillas. This fall, there have been at least two reports of U.S.-paid-for helicopters being directly involved in combat with guerrillas. Colombian activists say the Army will use U.S. aid to continue the Dirty War of human rights violations against community leaders, human rights activists, and labor union organizers. Even school children are targets of Colombia's Army - on August, 6 children were murdered when the Army fired in their school group during a field trip. Fight Back! : What is Colombia's 40-year civil war about? Jessica Sundin: There is zero political space for progressive people in Colombia to decide their own country's fate and there is a real need for change. It has the highest unemployment rate in Latin America. Even though it is rich in natural resources, many people in Colombia are homeless, can't get health care or a decent education. Every day Colombia's rulers sell off another piece of the country to foreign corporations. A handful of rich people run Colombia in their own interests. They keep themselves in power through violence. Colombia has the worst human rights record in all of Latin America. Anyone who speaks out for something different becomes a target of the most brutal military and paramilitary organizations (death squads) in all of Latin America. Fight Back! : Who was at the conference and what did they say about Plan Colombia? Jessica Sundin: The conference brought together hundreds of people: Leaders from the teachers union and the oil workers union, environmental activists, students and youth, progressive journalists, human rights workers, women leaders, and people from the Colombian left. Every person I spoke with said Plan Colombia is a plan for war. Because everyone at the conference was an activist, they are the civilians that are most threatened by the U.S. giving more weapons to the Colombian Army. They have fled their hometowns because of the violence, and every one of them has had friends and family murdered. They say the last thing Colombia's brutal army needs is more weapons. Plan Colombia will spray more toxic chemicals over suspected coca crops. So far, these campaigns have been one hundred percent negative. The government has sprayed areas where there were no coca crops at all. Many families have fled the fumigation because the chemicals were poisoning their children, the water, the air and the land. The sprays don't just kill coca crops, they kill food crops. The other problem with Plan Colombia is the "Push into Southern Colombia." Most U.S. military aid will be used to sponsor a Colombian military offensive against the guerrillas based in these areas. Fight Back! : What are Colombians doing to try to change Colombia? Jessica Sundin: I was inspired by people organizing in Colombia, in spite of the violence. Just days after I left, almost a million people joined in a general strike to say no to Plan Colombia, to stop the privatization of state-run hospitals and other industries, and to defend wages and jobs for state workers. Human rights workers in almost every small town are working to document human rights violations and bring those who commit these crimes to justice. I met indigenous leaders working in their communities to stop the sell-off of native lands to foreign corporations. I met students and young people fighting to keep public universities open. People are organizing strikes, and protests and letter-writing campaigns demanding an end to human rights abuses, to call on the government to meet peoples basic needs, and to get the U.S. out of Colombia. Fight Back! : You spent a few days in an encampment of the Revolutionary Armed Forces of Colombia (FARC) and met with their chief negotiator, Comandante Raul Reyes. Could you describe the FARC and why they have taken up arms? Jessica Sundin: The FARC is made up mostly of campesinos and poor peasants, the most exploited people in Colombia. They say that the FARC is the only way to make a better life for themselves, their families and for all Colombians. History shows that there are no open legal doors to social change in their country. The traditional parties make decisions that serve the interests of a handful of rich that rule the country. The members of the FARC want to turn that around, to have a New Colombia that is run by the majority. The mainstream media portrays the guerrillas as not very serious people or as part of a criminal enterprise. Could you describe the encampment and the city it's near, San Vicente? How is it different than the rest of the country? Having met the combatants, do you agree with how they are characterized by the media? San Vicente and the encampment where I stayed are both in the Zona Despejada, or Cleared Out Zone. It's called that because there's no Colombia Army in the area, and it's controlled by the FARC. San Vicente is a town of about 15,000 people. Before the military, and death squads cleared out of the region, someone was killed there almost every day, for political reasons. Since the area has been under FARC control, it is without a doubt the safest place in the country. Everywhere I went, there were public service announcement signs posted on the walls or tacked up onto fence posts and trees. The signs said things like protect the water, and take care of your children. They were all signed FARC-EP. Life has improved since the FARC took control. They've built houses and parks, and they've put in new roads. The FARC are honest people with serious convictions, fighting for progressive social change. They are the people of Colombia - most the combatants I met grew up in the same area where they are now stationed. The combatants are intelligent, articulate people, they're young and old, men and women, some of them are indigenous, some are Afrocolombian, they work incredibly hard from 4:00 in the morning until 8:30 at night. They have a sense of family among themselves. They are good people fighting for a good cause. Fight Back! : What does the FARC say about the prospects for peace in Colombia? Jessica Sundin: On the one hand, there is optimism. The FARC has been sitting down to peace talks with the government, and civilians have a big part in these talks. The voices of thousands of young people, women, activists, and other civilians have come to the FARC zone to speak out about what they want in a New Colombia. 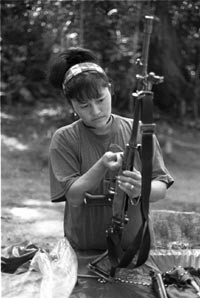 Their voices inspire the FARC combatants. At the same time, the FARC doesn't see the talks with the government as a dialogue to end the war, but a dialogue to win reforms that can improve people's lives today. They won't give up their arms while the elite remain in power. They're up against a powerful enemy, not only the Army and government of Colombia, but the U.S. army and government as well. The FARC is very strong. Along with the other guerrilla armies, they number about 20,000. Fight Back! : What did Comandante Reyes say about the role of U.S. anti-intervention activists in impacting the human rights situation in Colombia and helping their fight for peace with justice? Jessica Sundin: It was an incredible opportunity, and an honor, to meet with Comandante Raul Reyes. He was my host in Southern Colombia. He's a very warm and thoughtful man, who told me time and again that he was so pleased that we were there. Like so many of the people I talked with, he asked me to bring back a message of peace and solidarity. Members of the FARC are outraged by the escalation of U.S. military intervention. They believe that progressive people in the U.S. - revolutionaries, activists, people of faith, young people, union members - are their allies in trying to bring peace with justice to Colombia. The guerrillas and civilian activists alike told me that the single most important thing people in the U.S. can do is bring an end to U.S. involvement. I agree with them - to solve Colombia's problems and build a future, the best people to do that are Colombian's themselves. That's why we need to build a national movement that can really challenge U.S. policy. We can take inspiration and lessons from what was done here in the movements to end the war against Viet Nam and to get the U.S. out of Central America. That's just what we're doing with the Colombia Action Network. With committees in cities and towns across the U.S. - and we need more - we are building a national network that can say no to U.S. intervention in Colombia. The war on the people of Colombia is not in our interests - of progressive people, and poor and working people here in the U.S.. Because it's our tax dollars that politicians are spending to hold Colombians down, we have a special responsibility to stand up and say no. There will be thousands and thousands of us in Fort Benning, Georgia, to protest the U.S. Army School of the Americas. Tens of thousands of people have already called and written their politicians, to stop U.S. military aid to Latin America's most brutal military. We need to take to the streets in protest. We need to get on the phone and pressure our politicians. We need to come together and build a militant, mass movement to stop U.S. intervention in Colombia.